fuckedgaijin • No Escape From The NHK Man? 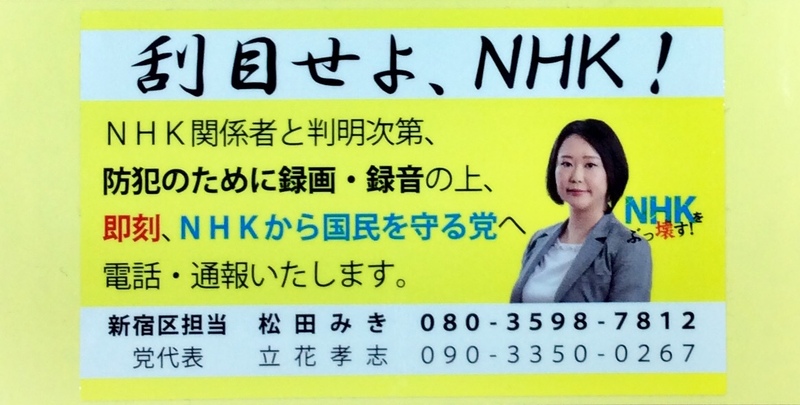 Re: No Escape From The NHK Man? legion wrote: Would the radiating power in number 2 apply to any metal pole sticking up outside? That stuff is kind of freaky when you think about it, it means we are constantly being bathed in David Attenborough radiation. The electromagnetic radiation can be absorbed by a metal pole by at most 50% in the optimal case, and the rest is re-radiated into the environment. Yes, we are constantly bathed in electromagnetic radiation. There are nowadays even techniques to harvest energy from it (call backscattering). I don't want to scare you guys, but the star which is at the centre of our solar system is pumping out electromagnetic radiation at a phenomenal rate -- some of it you can even freaking see with your eyes! -- and plenty of it gets through that muffling blanket called the atmosphere. Not to mention that we happily carry radio transmitters -- commonly called mobile phones -- either next to our hearts or next to our gonads. Does that mean David Attenborough is on my gonads? I still find it amazing that data flies through the air and magically turns into coherent information. That electronic energy can become a voice or text or an image fills me with awe. It amazes me even more that other people take this for granted. I still find it incredible that a needle vibrating along a vinyl groove can become a sound. I can just about understand that when I blow across a hole I can produce a sound. Physics is amazing, and the engineers who can manipulate it to do all kinds of stuff even more so. Not physics, more just engineering but the whole notion of packet switching, and what it can achieve fills me with admiration. So clever, so efficient and so transformative. It's one thing to send a dedicated radio/TV signal to a receiver but another to be able to send and receive vast amounts of widely differing stuff all at the same time. It is indeed amazing. BTW, I forgot to mention that a lot of math is involved too, not just physics. But it is the engineers who put it all together. NHK preparing to charge households with Internet connections who don't have TV. For the time being, they won't levy such a charge, but they state in the future they might. Which translates into common language as "in the future they will". They have now gained approval from the ministry to simultaneously broadcast on the Internet, and by lowering the viewer's fee they hope to gain enough support in society for their extortion schemes. In the end, the solution is of course very easy. The Internet being the Internet, they can just make NHK a paid subscription service, just like the others. Let's see how many people then will still subscribe. How does that work with free WiFi? If you have a device capable of receiving Wifi...you're fucked? Russell wrote: NHK preparing to charge households with Internet connections who don't have TV. Sounds like the locals caught on to the "I don't have an antenna and that's just a really big computer monitor" story that most gaijin give the NHK collectors. Unless it is going to be bundled in with ISP billing, they'll still have to get you to sign a contract. TOKYO - The Supreme Court has finalized high court rulings ordering owners of a cell phone with a television function to pay a subscription fee to Japan's public broadcaster NHK, Kyodo News learned Wednesday. Presiding Judge Toshimitsu Yamasaki ruled Tuesday in two cases that the broadcast law applies to an individual who owns a cell phone with a TV function, rejecting appeals by the plaintiffs. One of the lawsuits was filed by a member of the Asaka city assembly near Tokyo who does not own a TV set, and the Saitama District Court decided in August 2016 he was not obliged to pay the subscription fee because possessing such a cellphone was not necessarily equivalent to installing a TV signal receiver. In March last year, the Tokyo High Court overturned the ruling saying the possession of a cell phone with a TV function should be regarded as installing a TV receiver, and that owners of such devices and people having TV sets need to be treated equally to ensure fairness as long as they can watch NHK channels. In another lawsuit, both the Tokyo District Court and the Tokyo High Court have ruled that the owner of a cell phone capable of receiving TV signals but without a TV set at home still needs to pay a subscription fee to the public broadcaster. NHK issued a statement and said the top court made a "reasonable" ruling in line with its assertions. Quite aside from that, you live in Chiyoda-ku not in Shinjuku-ku, so your contact representative would be different. Re: Cell phone TV owners to pay public NHK subscription fee. At the end of the day, you're under no obligation to answer the door or any questions the NHK reps have so unless they are going to demand carriers provide information about keitai models (sure that would go over well with both the carriers and customers) their customers are using enforcement isn't going to be easy. matsuki wrote: 1-seg... is a pretty much a Japan-only feature and mostly implemented by Japanese manufacturers. I'm sure they're happy about that. The majority of Japanese cars have built-in a combination GPS Navi and Entertainment system with 1-seg. Owning a foreign car would good way to beat NHK too just like owning a foreign smartphone. Yep...I swapped out the outdated one in my 'Yota with an aftermarket Chinese Android unit. No 1-seg unless you buy a seperate unit that plugs in. (and let's be serious, which one of us wants to see the local TV in their car that bad?) It has a browser, can play media, and tethers to my keitai so I didn't opt for that. Does the TV function refer to a specific app? I think a coworker has a TV tuner that uses an antenna to pick up programs. I can't see anything on my Android phone that could pick up a NHK broadcast. I had the local NHK agent come by yesterday...he had some sort of tablet that emitted the same tones as a takkyubin employee, hence me answering the door. Two snarling doggies and a furriner to greet him wasn't what he expected. He was a younger guy, polite, and after letting him know that a TV tuner wasn't worth my time he said he understood and ran through the two other checks. Keitai - google pixel...no 1-seg. Car? with Navi? Indeed, nice new one with a nice big screen....and no TV/1-seg hardware. He did a rather polite bow while thanking me and apologizing for taking my time. Not exactly the boogeyman we often hear about but thus far my several experiences with them have always been about the same, just with new questions. Will be interesting if they start requiring payment if you have internet connectivity before giving in and just revising the funding structure NHK.